Modern eCommerce designs should not only look good, but also be responsive, deliver A-grade user experience and provide built-in tools for product marketing. In the 90s and early 2000s usage of large images, and even more so – videos, was inadvisable due to the low Internet connection speed. But nowadays such design solutions open new horizons for owners of online stores. It has been proved that visual information is absorbed faster, so media content has a greater chance of leading a potential customer to making a purchase than plain text. Besides, professional high-quality photos just look awesome and have a magical effect on visitors. Who can resist the well-filmed background video in full screen? Many huge eCommerce shops have adopted this trend and are satisfied with the results: among them are Bentley Motors, Adidas, Nike and Tiffany & Co. This responsive OpenCart template by TemplateMonster boasts a large photography slider that occupies the entire above-the-fold area. A sidebar menu on the left is retractable, so the basic layout is stretched full-page. This simple yet effective trick helps to save space and makes the design more visually attractive. The sidebar itself consists of various menus, search and newsletter forms, social media buttons and other utilitarian elements, partially duplicated in the footer. 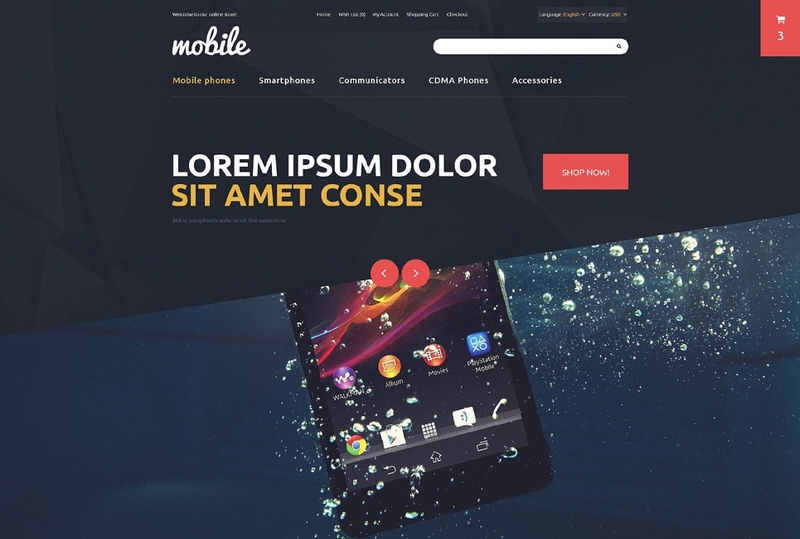 “Mobile” is a modern template for OpenCart-based online stores selling mobile phones, musical instruments and computers. It boasts a progressive design based on the modern mosaic patterns. They can be spotted in the background and in the parallax blocks. These textures are different, but combined they look harmonious and natural. The template is integrated with the Olark Live Chat to help you provide top-notch support for your customers. The main feature of this template is its huge top area covered with one single image. Here you can spot a menu, a search bar, some essential buttons and a logo. The design uses very large typography and huge icons to attract attention. 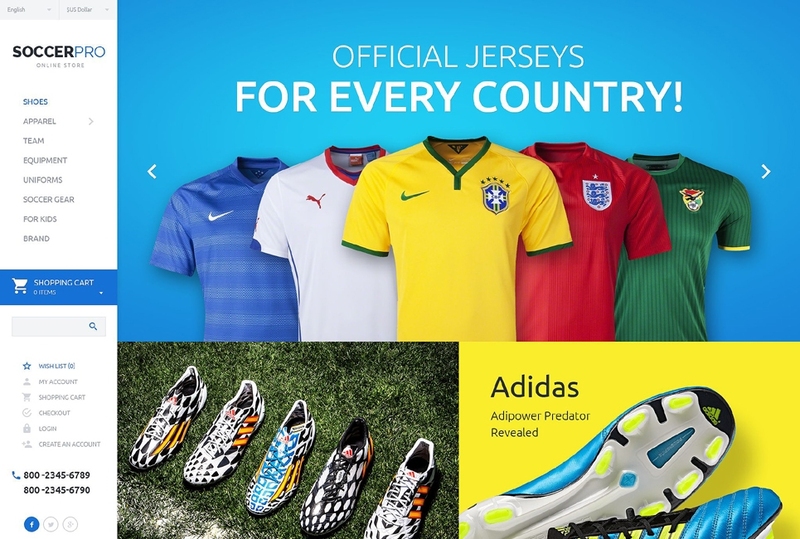 There are not many product previews on the homepage – the template focuses on a few chosen items to boost their sales. Black and white photos are often the most expressive ones. 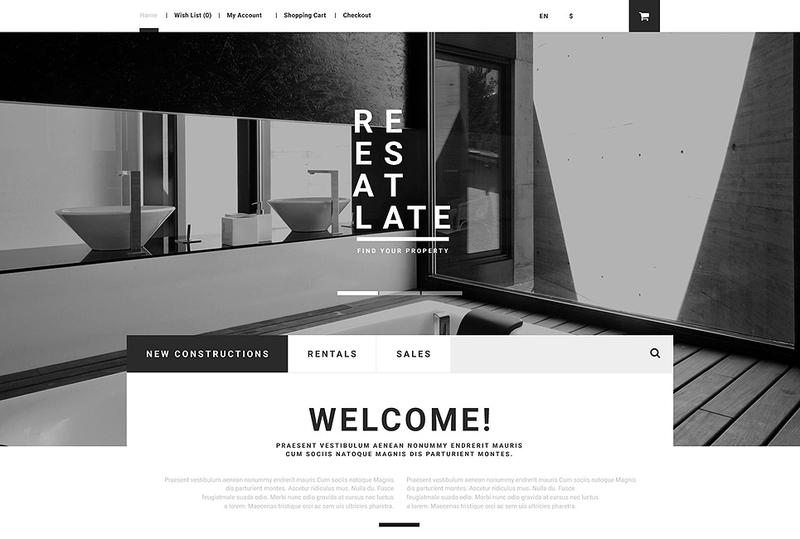 That’s why you should try this monochromatic Real Estate template with your OpenCart store. Full-color photos incorporated into this design will perform twice as effectively, appealing to your customers’ psychology. 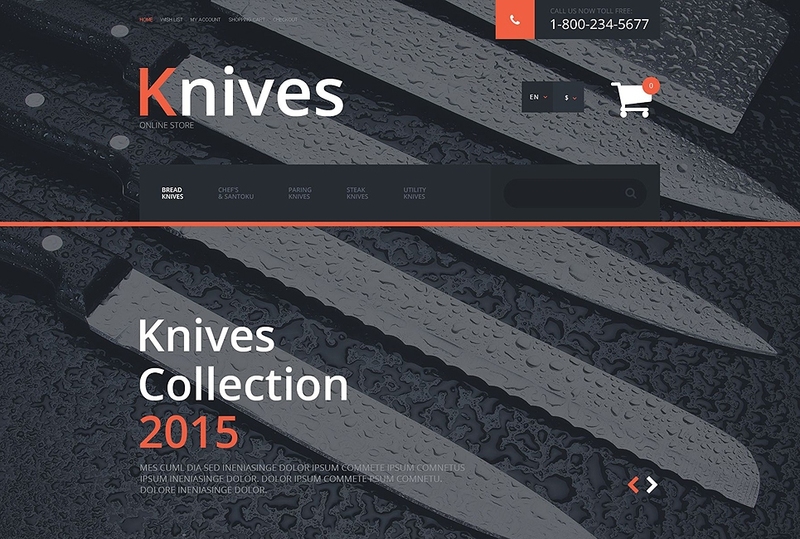 This purely industrial template is perfect for online shops offering exterior design products, architecture and renovation services or construction materials. It is responsive and works properly on any modern device. 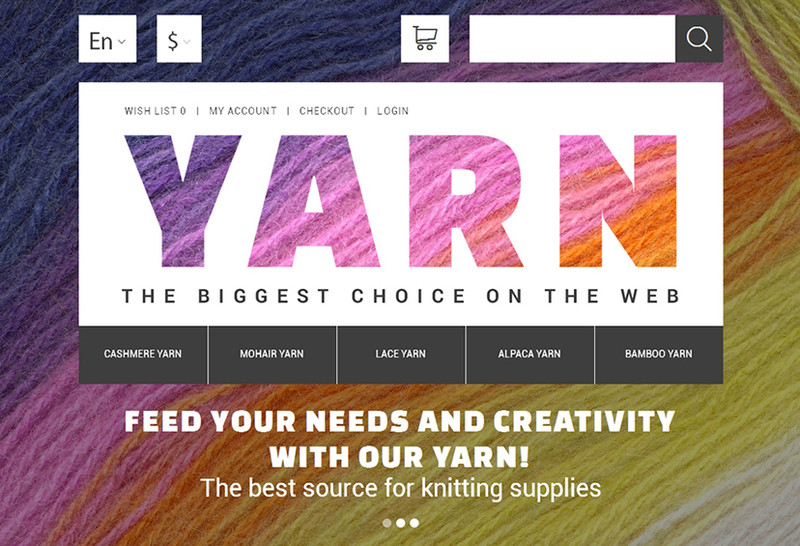 The next design on our list is Yarn – an OpenCart template for hobby stores. 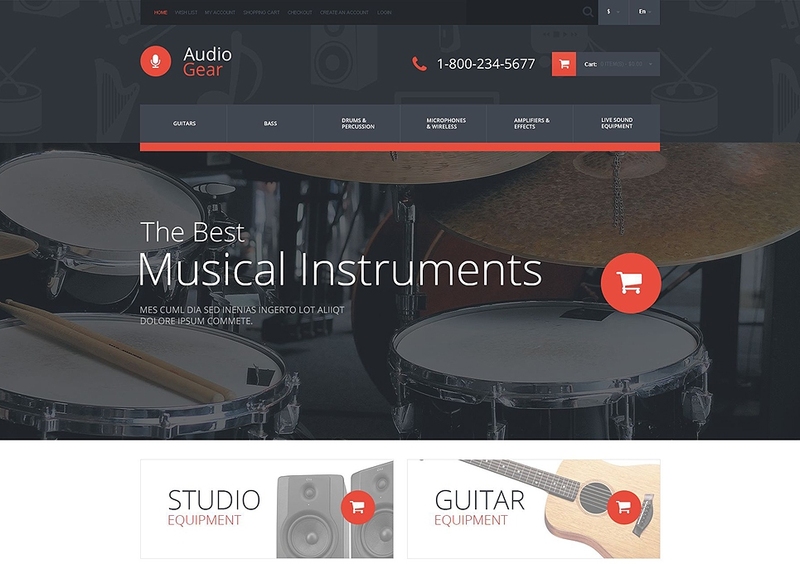 It features a large top slider, like most of the templates presented in this article. Its logo, both main and category menus and a search bar are placed in the middle of the screen. Flat-designed blocks with special offers become transparent on hover, and thus increase the importance of high-quality imagery. The template is equipped with a live chat, a Facebook like box, customizable sliders and multicurrency support. Now it’s time for classics. 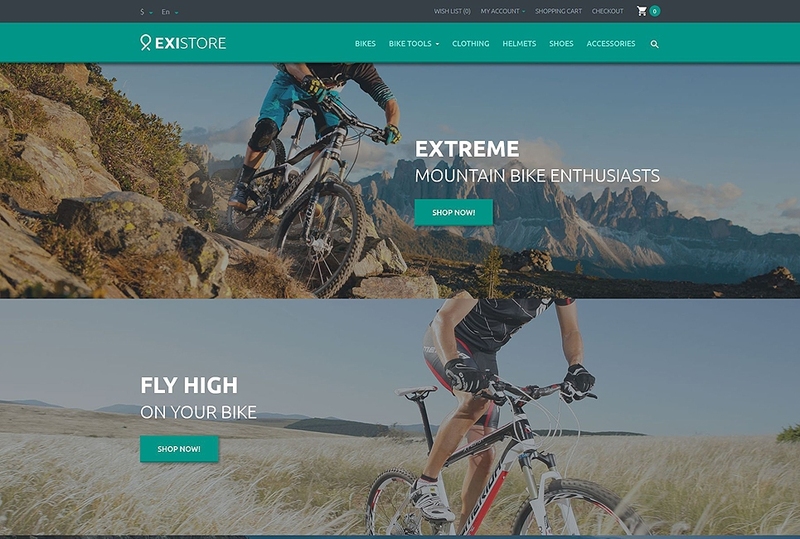 ExiStore was among the first OpenCart 2.0 templates by TemplateMonster to rely on full-width images - and it still looks contemporary. Under the top sticky menu there are three sliders, which move simultaneously, creating a unique optical effect. Other design elements are flat, outlined with a shadow to be more visible. The product page comes with Cloud Zoom effect, color, size and quantity pickers, reviews, and related items. This elegant, somewhat feminine, OpenCart template is intended for interior design online shops. Its layout is built mostly of large tiles, filled with photos. They serve as links to specific categories and offers. Besides the category tiles, you can spot an area with featured products here. 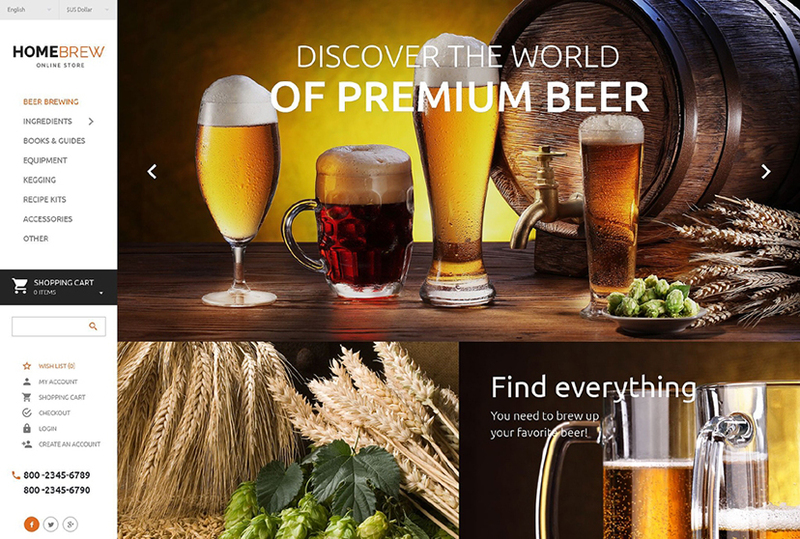 Product pages are full-featured, with product galleries, reviews, customizable descriptions and filters. This one is another template using mosaic patterns. 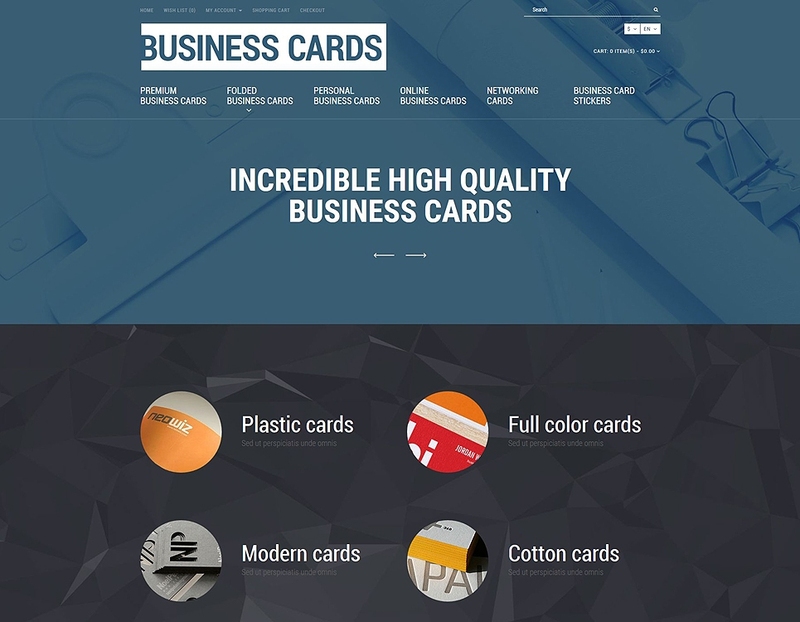 The Business Cards template is strict and formal, but not dull. It is decorated with circular images. You may use pictures of any shape – the script will automatically crop them. Grid and list category views are available for showcasing your assortment. In all other respects the template is quite minimalist and product-centric. If you are looking for a design able to power your music audio store, check out Audio Gear. The ‘Manufacturers’ block is highlighted, because it is essential for musicians. To highlight the musical orientation of the template, its category menu buttons display the equalizer effect on hover. Instant ‘Add to cart’, ‘add to wish list’ and ‘quick view’ actions are available for product previews on the homepage. 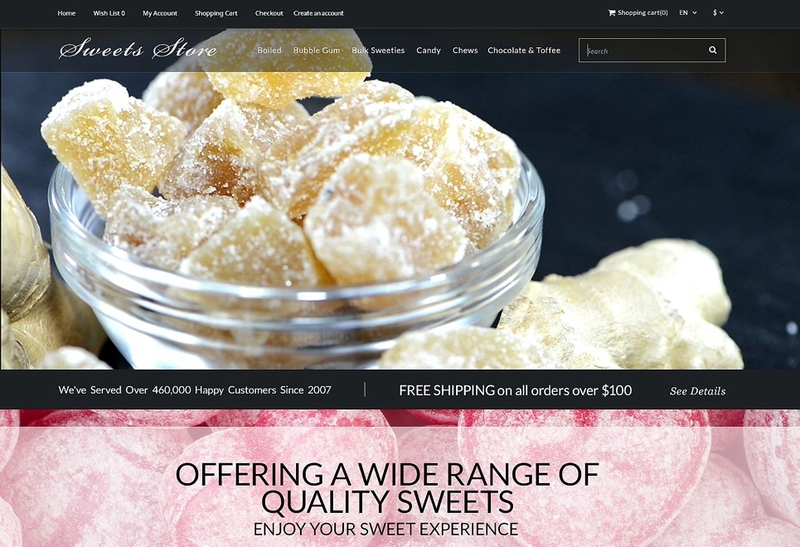 Pay attention to this OpenCart template for sweets and pastry stores. Various product lists alternate with narrow sliders, so the layout seems to be completely covered with images. The transparent menu is simple and minimalist, but stylish and quite functional. It consists of two layers – eCommerce essentials (Home, My Account, Wish List, Shopping Cart, and Checkout buttons), and a category menu with a logo and a search form. This responsive OpenCart template has been designed specifically for sports and casual clothing stores. Its navigation bar was moved to the left, freeing space for visually pleasing page-width photos and banners. A bright pop-up newsletter form was incorporated to gain new subscribers quickly and run effective email marketing campaigns. The layout itself is clean and professionally-designed, so you shouldn’t worry about usability of your future store. 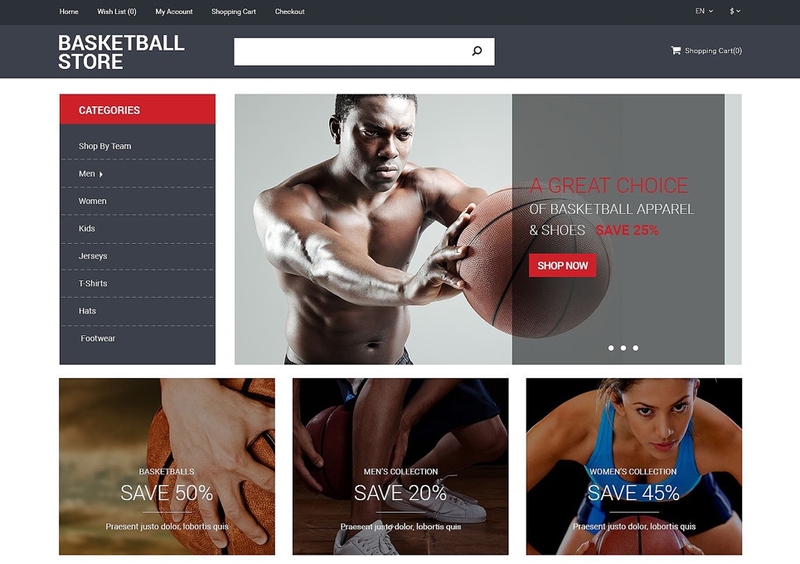 The last OpenCart template for today is for sport stores too. The space under the header contains a left-aligned menu and a slider with a semi-transparent layer. On hover the Mega Menu takes the place of the top slider. The area above the footer contains photos from your company’s Instagram account (3 last published photos with the number of likes are displayed). The template looks simple and classic, but it benefits from the use of high-quality images too. Additionally, you can promote your Instagram account and thereby generate more social traffic. As you see, in the age of Web 3.0 large images, background videos and creative CSS effects are the recipes for success even in such an established field as eCommerce. Try something completely new – and you will see positive results immediately. Good luck with redesigning your OpenCart store!